Christmas Holiday Trail of Lights in East Texas and Louisiana. In the 1940s, a drive through Kilgore was unlike any other excursion into East Texas. Then, the underground oil pools played out. 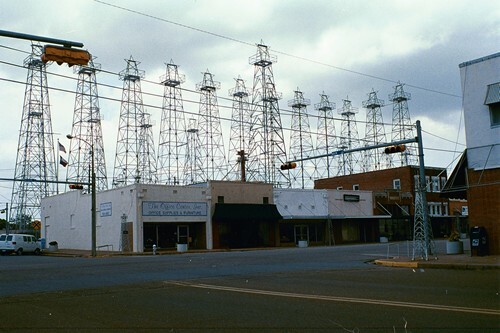 Kilgore’s oil derricks began to disappear and Kilgore soon looked like any other East Texas community. Today, steel replicas of the old derricks are back, thanks to the work of the Kilgore Historical Preservation Society. And the Christmas lights are back, too. A view of the "the world's richest acre"
Each Christmas, Kilgore lights up its derricks and produces a sample of what the town looked like some sixty years ago. The lights are turned on the first Saturday after Thanksgiving and remain lit until after January 1. Stars top the sixty replica derricks, helping the city maintain its title as the state's official "City of Stars." Kilgore is also among the stops on the Holiday Trail of Lights, which includes Marshall and Jefferson in East Texas and Natchitoches and Shreveport in Louisiana. On Oct. 3, 1930, in a Rusk County pasture, 70-year-old "Dad" Joiner brought in the Daisy Bradford 3 and unknowingly tapped into the world's largest pocket of oil. The resulting oil boom brought thousands of producers and drillers into East Texas, turned the quiet little communities into raucous boom towns and made millions for oil producers. The boom also brought con men, prostitutes, thieves and other criminals before Texas Rangers were assigned to clean up the area. When the Rangers filled up the jails, they chopped a hole at each end of an old church building, ran a chain the length of the building, and chained and padlocked prisoners to the chain. If a prisoner need to use a restroom, a bucket was passed down the chain. Even though the oil patch isn’t as prosperous as it once was, oil remains a big part of the economy of Kilgore and the city remains a popular destination place for tourists who want to learn how oil in Texas began. Kilgore has carefully preserved the legacy of its boom years with the East Texas Oil Museum near the campus of Kilgore College. Visitors from more than 120 countries have visited the museum, which is not only the cornerstone of oil history in East Texas, but one of the leading destinations for tourists in East Texas. This Christmas, if you remember the old wooden derricks from East Texas’ past, come to Kilgore for a hefty dose of nostalgia from the forties.